What are the main features of the Gear VR Innovator Edition for S6? The Gear VR Innovator Edition for S6 powered by Oculus™ (also referred to as Gear VR for S6) is a headmounted, virtual reality device that provides an immersive experience for a wide range of users. When you connect a GALAXY S6 to the Gear VR for S6, you can enjoy multimedia content and play games by launching apps on the GALAXY S6. You can use the Gear VR for S6 with the GALAXY S6 or GALAXY S6 edge and connect additional devices, such as a game controller or a Bluetooth headset, by connecting them via Bluetooth to your Galaxy S6 device. Note: Samsung Gear VR Innovator Edition for S6 is powered by the Samsung Galaxy S6 or Galaxy S6 Edge and is not compatible with other smartphones or devices. Note: Some high-quality gaming apps may require the use of an Android game controller, sold separately, to offer control capabilities in addition to the Gear VR’s integrated touchpad and tracking sensors. The Samsung Gear VR Innovator Edition delivers a completely new immersive experience never seen before by surrounding you with 2-D & 3-D 360-degree video, photos and games. The Galaxy S6/S6 Edge’s amazing AMOLED screen and processor combined with the power of Oculus technology deliver an ultra-fast, ultra-smooth and ultra-immersive experience for you. Together, Oculus and Samsung have pushed the limits of mobile virtual reality technology to make you feel like you are really there, in the experience. Samsung Gear VR is easy to use with a touchpad control, dedicated back button, and a USB port for supplemental VR accessories and power. Transform your Samsung Galaxy S6/S6 Edge into an unparalleled video-watching or game-playing experience anytime, anywhere. Try it at home or bring it to a dinner party and steal the show. 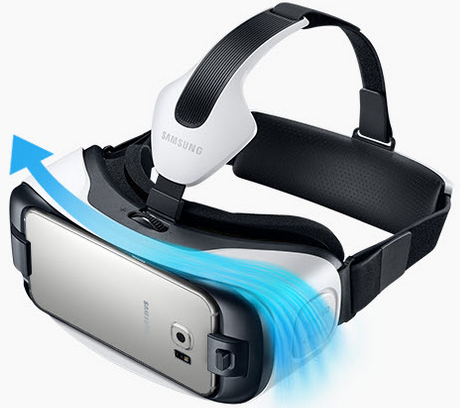 Simply snap a Samsung Galaxy S6/S6 Edge into the headset, and dive into a plethora of virtual reality experiences. The Gear VR Innovator Edition for Galaxy S6 comes with an integrated cooling fan that prevents lens fogging, allowing you to enjoy crystal clear images during video playback and gameplay. Gear VR for S6: How do I install the mobile device on my Samsung Gear VR for S6? How do I turn on Do not disturb mode on my Gear VR Innovator Edition for S6? 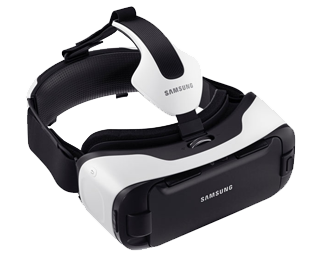 Gear VR for S6: How do I install the straps on my Samsung Gear VR for S6?